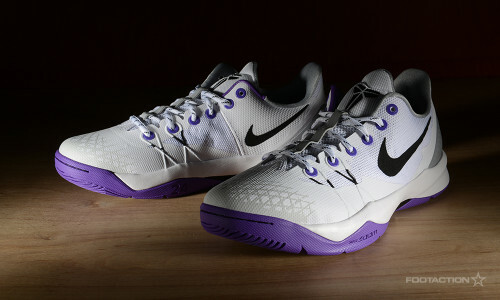 The Nike Zoom Kobe Venomenon 4 gets a fresh new colorway that is dominantly white with pops of grey and purple. This is a “Lakeshow”-friendly sneaker that isn’t overbearing towards rocking these kicks with other colors. As to be expected, the Kobe Venomenon 4′s come equipped materials for performance: Nike Zoom cushioning with Hyperfuse and Flywire on the upper. This specific look shows that toning it down actually reveals the silhouette’s finer details. Print article This entry was posted by hhcblog on April 26, 2014 at 6:54 pm, and is filed under Footwear. Follow any responses to this post through RSS 2.0. You can leave a response or trackback from your own site.